When learning how to lead a horse, you should know that it is traditional for you to be on the horse’s left side. It is better horsemanship if both of you are comfortable working from either side. Generally, unless you have done all his training he will be more comfortable with you on his left side. As your leading skills increase you can try it from his right side. Never, ever wrap the slack of the lead rope (or reins if he has a bridle on) around your hand or any other part of your body. 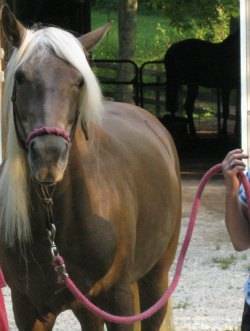 If the horse decides to go somewhere, spooks at something or tries to run off, you don’t want to be firmly attached to a scared, running 1000lb horse! Same goes for coiling the lead rope. If it is coiled up (looped) it can become tight quickly and take your finger off in a bad situation. 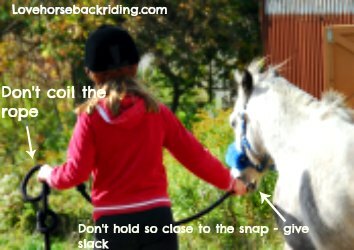 Let the slack drag out beside you (if your horse is OK with that) or fold it into half or thirds and hold the middle. That way it can’t tighten around your hand. This tip seems logical, but you would be surprised how many experienced horse people wrap or coil a rope around their hand. Coiling a rope or placing it around your hand is asking for an accident. It can make a horse panic if he is held too tightly. Allow his feet to drift some if needed. To lead the horse, stand at his side with his head or front of his neck in line with your body. Your goal is to keep him there with you no matter your pace. If he lags behind, you may need to use the slack of your rope (or use a training stick and/or string) to give him a few rhythmic taps as far back as you can reach. That will encourage him to move forward with you. If he is too fast and gets ahead of you you’ll have two choices. Get his attention by turning around and heading in the totally opposite direction. This encourages the horse to pay attention to you. It is usually enough to get him back in line with you after a couple goes at it. If he still leans on you, consider using a rope halter to make what you are asking more clear. Pull his head towards you and use your rope to push his behind away from you. Stay Safe! Always get his nose to point towards you so his hindquarters move AWAY from you. You don’t want to end up getting kicked! This will still have him facing the wrong way from what you were going, but if he was that far ahead he wasn’t paying much attention to you anyway and likely left you in an unsafe position. With some practice and as you gain your horse’s confidence and respect by schooling him on the ground, these leading problems will disappear. With some practice and as you gain your horse’s confidence and respect by schooling him on the ground, your leading problems will disappear. A well schooled horse should match your pace at any gait and be attentive. I hope you have enjoyed learning how to lead a horse.